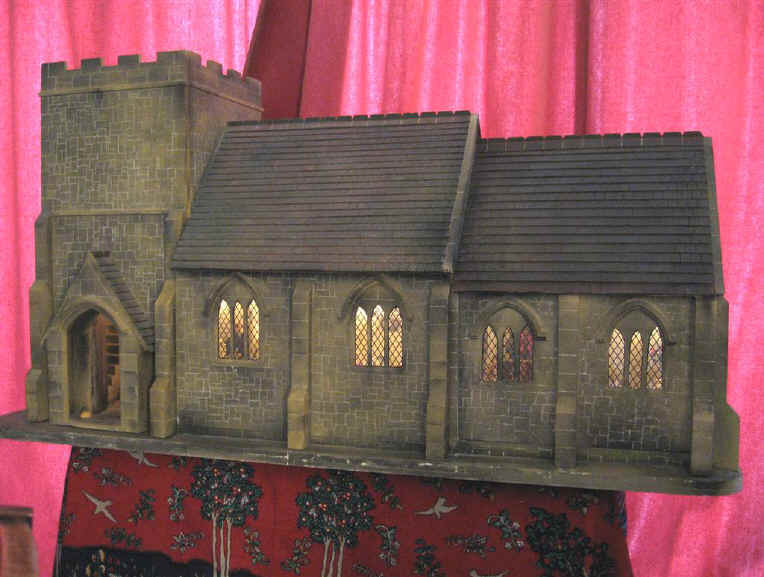 We have put together a few photos below of the church which begins with the time we brought it back from Vic Newey who had both put the kit together for us and painted and decorated it for it to look like a real old village church up to the time he also added an extension in the form of new chancel and sanctuary in 2006. 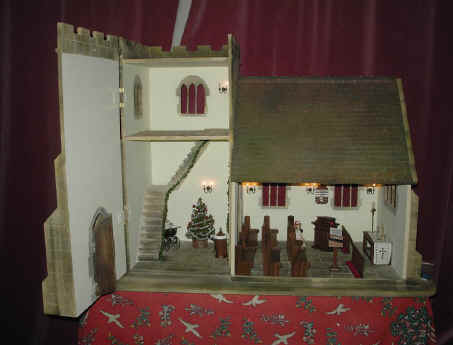 The church before the furniture arrived! The bell tower is just out of sight. 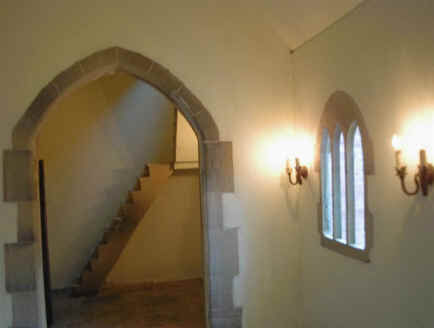 A view through the back arch towards the bell tower and stairs to the upper floor. 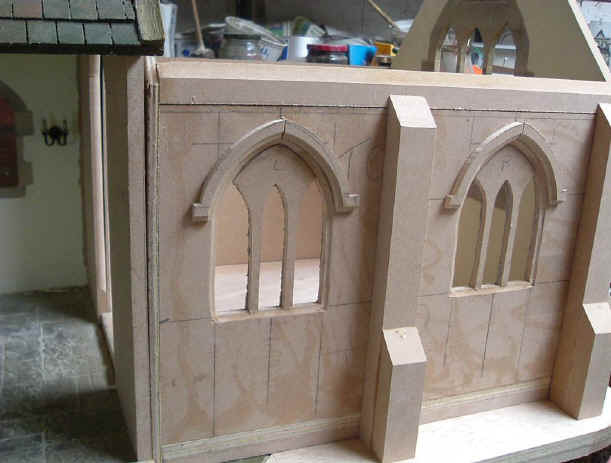 The realistic stone effect floor can clearly be seen here together with the stone effects around the door arches. The bell tower has got authentic looking floor boards. Difficult to believe that this is all special effects! 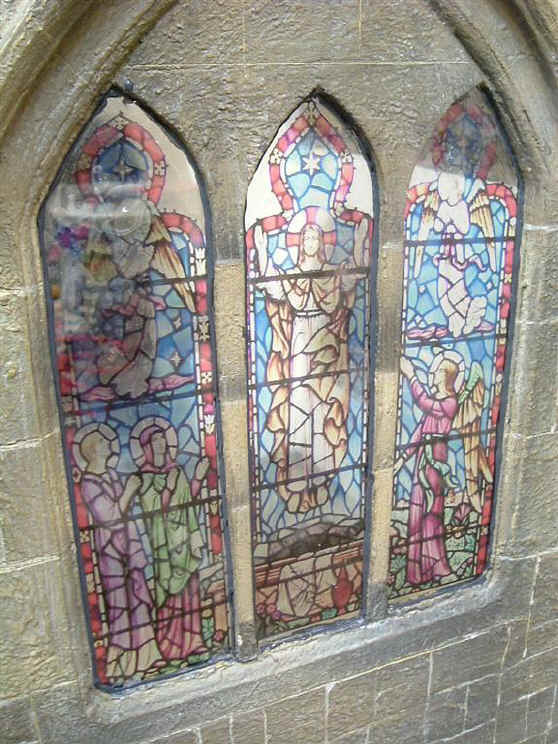 The original east window and wall panel has been removed in order to form the new east end with stained glass window in the new extension. 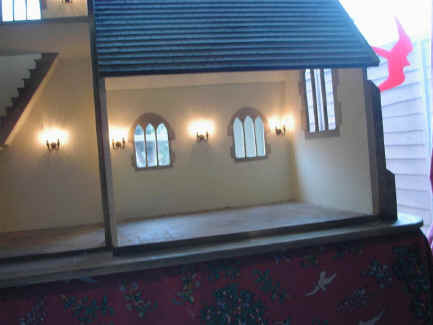 The new extension is now in place with windows. 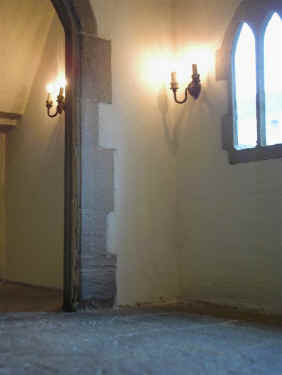 You can see that, in keeping with many churches, we have asked Vic to include a small half inch step up into the new chancel and sanctuary. This is the new stained glass window for the East Window of the church. It has been created by using a photo of part of a real stained glass window in St Mary's Church Cubbington, Warwickshire, United Kingdom. 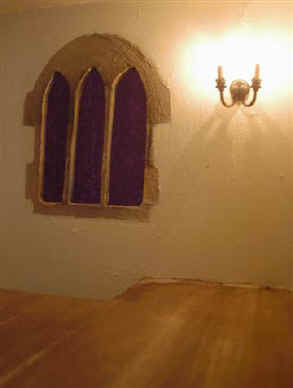 The images were created in Microsoft Word by ensuring that measurements would fit the three arch apertures. These were then printed on to sticky back thin acetate using an Epson R800 printer. Vic was then able to use this thin sticky acetate to stick on to thicker acetate and to place in the window frames. The work is almost complete here! 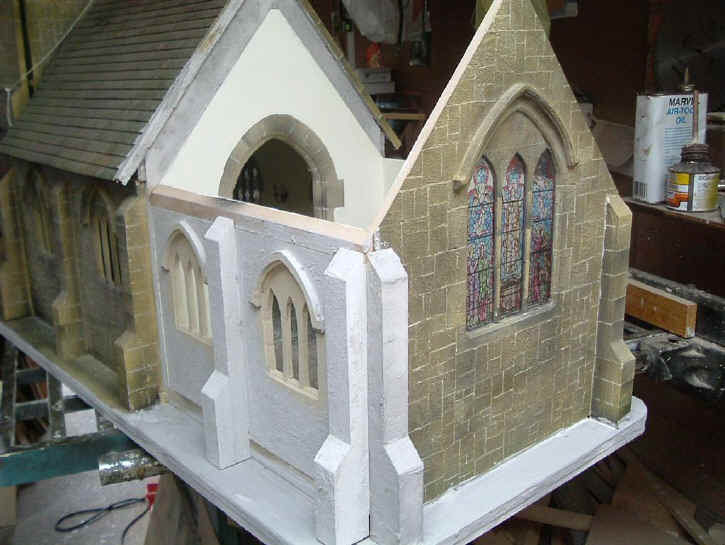 All Vic needs to do is put the roof on, put the new acetate windows in, and complete the outside finish to make it look the same as the original! Although it is not visible here, Vic has also put some louvres into the windows in the bell tower in anticipation that we will have some bells there in the future! 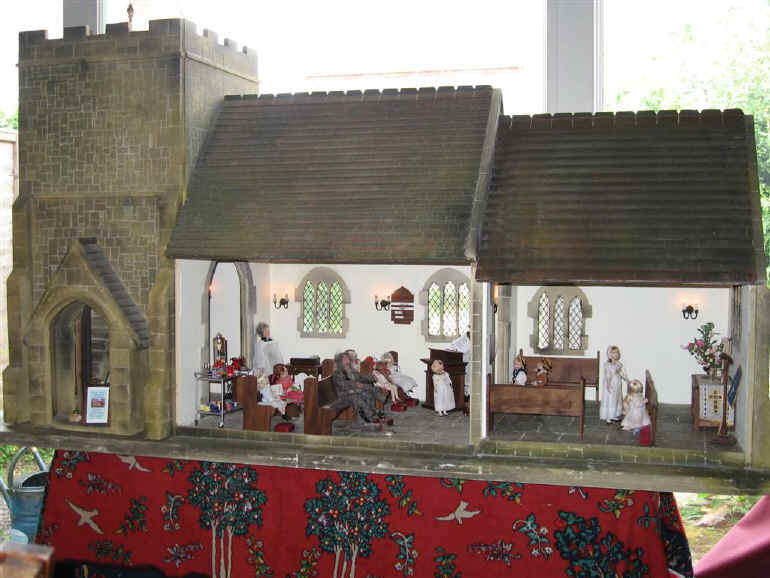 We are pleased to tell you all that we DID fit the bigger church in to our car and were able to transport it home again from Vic's workshop in Redditch.